In 1988, Sri Chinmoy found a new focus for his weightlifting: honouring his fellow man for their dedicated service to mankind. The ‘Lifting Up the World With a Oneness Heart’ award was founded, the centrepiece of which Sri Chinmoy would lift the recipient overhead with one arm as they stood on a specially constructed overhead platform. It all began with a suggestion from 5-time Mr Universe Mahasamrat Bill Pearl, who knew that while weightlifters and bodybuilders can appreciate immense lifts with metal plates, these lifts rarely capture the imagination of the general public. He advised Sri Chinmoy to lift people and objects instead. On June 26th 1988, Sri Chinmoy unveiled his first machines capable of holding people. After a few preliminary lifts, he invited Mahasamrat to ascend the platform on the overhead lift. 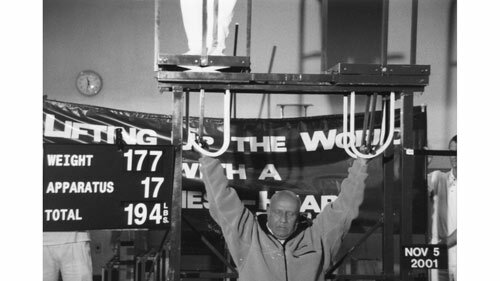 Together with the apparatus, Mahasamrat’s weight was 229 pounds; Sri Chinmoy’s was 151. He lifted Mahasamrat to full-arm extension and thus ushered forth a most remarkable odyssey in which over 8,000 individuals from Prime Ministers to schoolchildren were lifted. The initial apparatus included a pole for the recipients to hold on to as they were hoisted upwards; later apparatuses were modified to include a support rail. Many of the recipients would later testify to being lifted up not only in body, but in spirit. In addition, Sri Chinmoy would often compose songs appreciating the inspiring qualities of that person, and sometimes even set the recipient’s own inspiring words to music: these songs were then sung by a choral group of Sri Chinmoy’s students, and never failed to bring the recipient’s heart to the fore. An early version of the Lifting up the world apparatus. 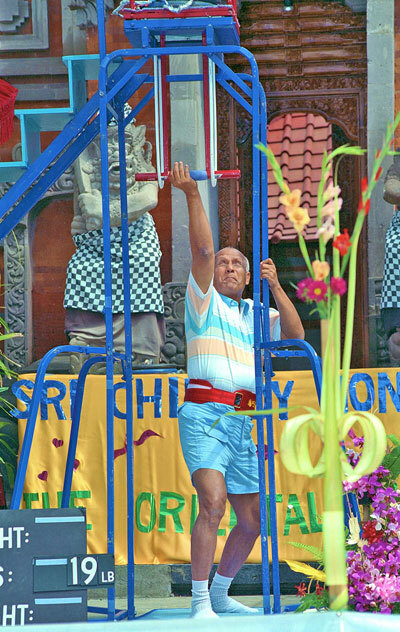 In this version, Sri Chinmoy lifted from a standing position. The seated version was developed so the person would be closer to the ground and also so Sri Chinmoy didn’t have to bear the weight on his bad knees. The Bill Pearl Story Bill Pearl writes about examples of Sri Chinmoy’s lifting up the World With A Oneness Heart such as a seated two-arm overhead lift of Daniel Deane August 16th, 2003 – for a total of 628lbs.